McManus will premiere his new book in downtown Oxford at Off Square Books at 5 p.m. Wednesday. McManus, director of landscape services at the university, said the book focuses on helping others improve themselves and inspiring mutual respect in the workplace. McManus and his team of landscapers have won five “championships,” as McManus calls them, in landscaping for the university. These championships include the university ranking in the Princeton Review’s “Top 20 Beautiful Schools” and receiving the Mississippi Urban Forest Council’s annual Scenic Communities award. Although McManus has already written a book, “Pruning Like a Pro,” this will be his first book signing at Square Books. McManus is not the only one excited about the signing. Lyn Roberts, general manager at Square Books, said she sees book signings as a great opportunity for readers to get involved with authors. Square Books and its offshoot, Off Square Books, have been devoted to connecting authors and readers since Square Books’ founding in 1979. All authors who come to visit Off Square Books are welcomed, but local authors are especially invited to come premiere their books at the store. McManus’ book is heavily inspired by the lessons he has learned serving as the director of landscape services. McManus remembered being highly motivated by the leadership qualities of former Chancellor Robert Khayat. 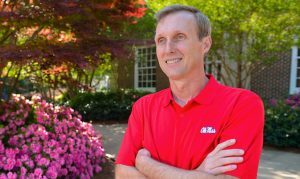 “[Khayat] was all about changing the culture and empowering people, letting people know that in the state of Mississippi we don’t have to think that we are in last place. We can be in first place. So I think this is a perfect testimony to him,” McManus said. Off Square Books will host approximately 160 events this year in which authors will come speak about their books and offer readers a chance to ask questions and get their copies signed. Today’s event is open to the public.